It may seem difficult to get past the proverbial box that looms large in strategic processes. 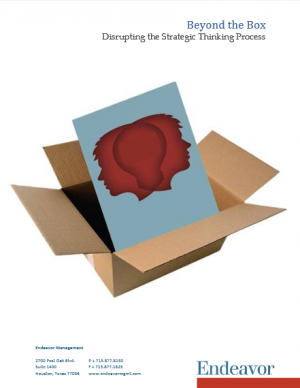 The dozen approaches that have been applied to strategic thinking sessions have de facto become their own boxes, due to their frequent deployment over the past decades. To think truly differently, individuals have to take their minds to different vantage points. From there, management can start to evaluate their businesses in a way that is simply impossible within normal business contexts. To escape the traditional box, an organization must learn how to access the "right brain" of as many people as it can within the group, thereby disrupting the typical thought processes residing within the organization. The result? Innovative, creative outcomes and unexpected discoveries arise when employees tap a part of their brains not often used to solve problems.